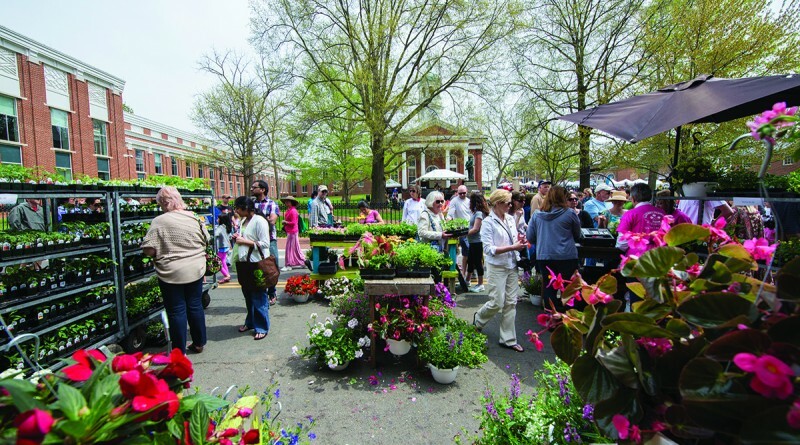 With the support of a promising weather forecast, big crowds are expected for this weekend’s Leesburg Flower and Garden Festival. “It’s crunch time,” Events and Outreach Manager Linda Fountain said Tuesday as signs of event preparation began to appear on the streets. As organizers marked off booth locations and hooked up water fountains, other town crews raced to complete the installation of new crosswalk markings, among the final touches of a years-long downtown spruce-up. Set against a backdrop of Leesburg’s historic 18th and 19th century architecture and anchored by the Loudoun County Courthouse, the festival will fill a six-block area of King and Market Streets, beginning Friday when vendors—some 140 of them—begin their set up. Six landscape designers will display their ideas for the perfect miniature garden, so visitors can get inspiration for their own back yards—as well as a wealth of design advice. Festival goers will choose the best display, casting votes for the People’s Choice award. Vendors offer an array of garden art, stained glass, furniture, garden-related equipment, garden hats and gloves, birdhouses, sheds, tiles and pavers, soaps and lotions and oils—everything for outdoor living. The festival also offers some great music to entertain the crowds, who can relax while having a picnic lunch or sampling some of the foods available from food vendors located throughout the festival area. A lively performance roster of acoustic music is available on the Main Stage on the courthouse steps for adults. Kids have their very own entertainment stage around the corner on Cornwall Street. They also have games, art projects and can plant seeds in terra cotta pots to take home. And connoisseurs of fine brews can head to the Town Green to the Beer Garden, where local and regional suds will be available to sample for a fee. All in all, the festival offers patrons two days of relaxed enjoyment—and a bounty of plants to take home to dress up their own gardens. For information, go to flowerandgarden.org or call 703-777-1368.